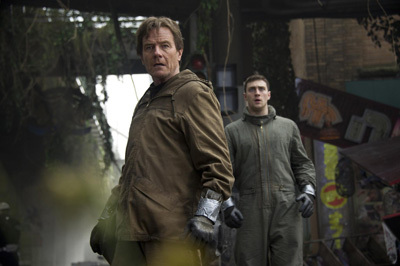 “Masterpiece” isn’t the first word you’d expect to describe a Godzilla movie, but that’s exactly what Gareth Edwards’ version is, at least on a visual and visceral level. Story-wise, it’s pretty good, too, especially in the context of a mindless summer tent pole. But then, mindless is only what we expect of it going in; coming out, we think of it as something else entirely. This is one of the richest, most awesome cinematic spectacles to come out of Hollywood in recent memory. In fact, it reminds us why we love the blockbuster in the first place. In many ways, yes, “Godzilla” is a traditional monster movie. It contains the obligatory violence and devastation; the widespread panic; the military intervention; the safe love story; etc. And of course, in this day and age, it’s padded with an inordinate amount of special effects. But to our pleasant surprise, the filmmakers actually harness these qualities rather than simply toss them into the mix and have them spin around chaotically. Director Edwards and his team show a surprising amount of restraint and patience when it comes to shots of buildings toppling, the sea rising, people running around scared, and random things exploding. They seem to only include shots that are necessary to get the point across instead of overloading us with effects and sensation just to show off the film’s budget. I actually checked my watch during the screening, and we don’t actually catch a glimpse of Godzilla himself until a good hour into it, and the movie is only two hours long. That alone should tell you something - that perhaps Godzilla isn’t so traditional after all. Monster movies are often too hasty to reveal the monster and then stick with him for the entire duration, as if that’s all we want to see. But even though Godzilla is the titular character, his screen time is limited, and that makes his presence all the more precious, if you will. We actually leave wanting more, which is so much better than wanting less.